After a 10-minute ride on the motorbike in the fresh August morning air, I arrived at the cafe and ordered some hot tea to warm me after the ride. I had a plan. 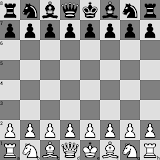 I pretty much always lead as White with my King's Knight - which I still planned on doing - but this time, set up a King's Indian style defence instead of focusing on attack from the start. My defensive start ended up letting Dane gain a big presence in the centre (to be expected), but I managed to obtain the better game. I think the key moves were: first, move 10 - we both made attacking moves with pawns, which I managed to come out a pawn up from once the dust settled; then, move 15, where I took his Knight with my Bishop, creating a doubled pawn for him. I wouldn't be surprised if Dane wins every game from here, but I'm happy I've at least got one win under my belt.